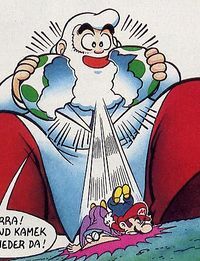 Mario in Mariozilla is the name of an 8-page comic in two parts, published in the 2/1996 and 3/1996 issues of the German Club Nintendo magazine. Kamek trying to shrink Mario. Mario, Yoshi and Toad are searching for Easter eggs in Mario's garden. Suddenly, Kamek followed by some Toadies invades the garden and claims that the "moment of revenge" has come. Kamek swings his broom in order to put a spell on Mario; he plans to shrink him. The Magikoopa and his fellows are pleased about seeing Mario start to transform; however, instead of getting smaller, he grows to an enormous size. Seeing his gigantic friend, Toad fearfully asks whether Mario has become evil. The plumber resolves his doubt; a step forward with his huge foot scares his friends and enemies away though, which makes Mario wonder whether his feet smell. He decides to ask Princess Peach for advice. Mario simply takes off the roof of her house. Despite her being scared, she advises him to call on Dr. Light, because he "always knows a solution". Mario climbing the Empire State Building. Dr. Light lives in New York City, so Mario goes there, with Peach in his hand. Due to his size (he is about as large as a mid-size building in NYC), he crashes several buildings on his way. Finally, he reaches the Empire State Building, where Dr. Light is working in the topmost floor. Because he obviously does not fit into the elevator, Mario decides to climb up the building from the outside. By doing this, he draws the attention of some people in a helicopter; a sneeze of Mario, however, makes the helicopter crash. When the plumber reaches the top, he looks through the window and spots Dr. Light and his friend Link inside. He puts his forefinger through the window, which hurts Light. When being asked what has happened, Mario explains that Kamek made him grow. Light's only advice is to search for Kamek again, because he appears to be the only one able to transform Mario back. The doctor also gives him a "magic cap" (which is in fact only a paper bag he pulls over his head), in order to make Mario "invisible". After a long way, Mario finally reaches Kamek's fortress. The Magikoopa has made himself grow in the meantime as well. He sends some Toadies out to attack Mario, but the plumber simply smashes them like mosquitos. Angrily, Kamek himself joins the battle against Mario. Dr. Light opening the egg with Kamek and Mario inside. During the battle, Mario breaks up Kamek's broom, forcing the Magikoopa to fight without any weapons. 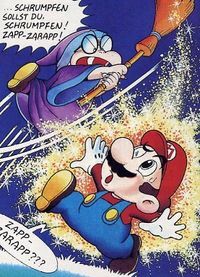 Unnoticed by the fighters, the broken broom pours out some purple magic fog which slowly wafts towards Mario and Kamek. Some Toadies wonder where the fog is coming from, and when it finally disappears, they try to join the fight again. However, Mario and Kamek seem to have disappeared. Actually, the rivals find themselves between huge blades of grass. When they spot the gigantic Toadies searching for their master, they realize that they got shrunk to ant-size. In this moment, Dr. Light, Peach and Yoshi join the party, anxious about Mario's state. Dr. Light correctly assumes that Mario has been shrunk by the broom's abilities. All people involved start to search for the shrunk. Yoshi, however, starts to jump around, which upsets Dr. Light because of the possibility that Yoshi could accidentally stomp the plumber. Actually, the dinosaur jumps directly to the blade of grass Mario and Kamek are sitting on. Seeing his gigantic friend, Mario calls for help. Yoshi, however, sticks his tongue out and swallows Mario and Kamek. Without any success, Dr. Light, Peach, and a Toady try to get the plumber and the Magikoopa out of Yoshi's mouth. Light's idea now is to make Yoshi lay an egg, but the dinosaur obviously doesn't think much of this plan and flees. Light, Peach and some Toadies chase him. Not until after two hours, when all involved people are completely exhausted, Yoshi finally lays an egg. Dr. Light breaks it up, and out come, as expected, Mario and Kamek. With the abilities of a special magical magnifying glass of Light, Mario and Kamek grow to their normal size. They hug each other and claim to "always stay friends". The title of the story obviously is a pun on the fictional monster Godzilla. Mario climbing the Empire State Building is a reference to the film King Kong, in which a giant ape of the same name climbed up the exact same building. 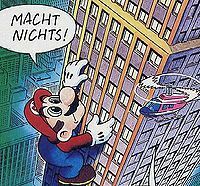 In the comic, the people inside a helicopter even refer to Mario as "King Kong". This page was last edited on September 24, 2017, at 19:59.